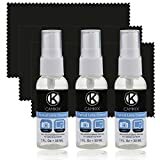 Camkix Lens and Screen Cleaning Kit – 3x cleaning spray, 3x microfiber cloth – Perfect to clean the lens of your DSLR or GoPro camera – Also great for your smartphone, tablet, notebook, etc. SIMPLE AND EFFECTIVE: Just spray on a small amount of cleaning fluid and use the included microfiber cloth to clean and polish the lens of your camera or the screen of your smartphone or tablet. NO MORE SMUDGES OR FINGERPRINTS: This cleaning spray not only removes dust, smudges and fingerprints, it also creates a ‘wax and shine’ type finish that prevents dust and smudges for a longer period of time than without the cleaning fluid. FOR ALL CAMERA LENS BRANDS: Safe to use to clean optical lenses of any brand, including Canon, Fuji, Nikon, Olympus, Panasonic, Pentax, Samsung, Sigma, Sony, Tamron and Zeiss. FOR ALL TABLET AND SMARTPHONE BRANDS: Safe to use to clean tablet and smartphone screens of any brand, including Acer, Apple (iPad, iPhone), Asus, BlackBerry, Dell, Fujitsu, HP, HTC, Huawei, Lenovo, LG, Microsoft, Motorola, Nokia, Panasonic, Samsung (Galaxy, Galaxy Tab, Galaxy Note) and Sony. ALSO SUITABLE FOR OTHER DEVICES: This cleaning spray can also be used to clean the screen of most action cams, notebooks/laptops, computer monitors, plasma/LCD/LED TVs, portable gaming devices, e-readers, smartwatches, audio/video players, etc. Includes two compact, travel size cleaning fluid spray bottles and two microfiber cleaning cloths. Easy to take with you, anywhere. Perfect to clean the lens of your DSLR or GoPro camera. Also great for your smartphone, tablet, notebook, etc. No more smudges or fingerprints. Just spray on a small amount of cleaning fluid and use the included microfiber cloth to clean and polish the lens of your camera or the screen of your smartphone or tablet. This cleaning spray not only removes dust, smudges and fingerprints, it also creates a ‘wax and shine’ type finish that prevents dust and smudges for a longer period of time than without the cleaning fluid. Suitable for: Camera Lenses, Smartphones, Tablets and Laptops including: Canon, Nikon, Zeiss, GoPro, Apple iPhone, Apple iPad, Samsung Galaxy, Samsung Galaxy Tab/Note and many more. CamKix If for any reason you are unhappy with any product by CamKix , please do not hesitate to contact us. We take full ownership and responsibility for the quality of our products and will do our very best to solve your problem quickly and efficiently! CamKix-USPTO# 86127507- is a registered trademark protected by US Trademark Law. CamKix products are sold by authorized sellers only. Posts related to Camkix Lens and Screen Cleaning Kit - 3x cleaning spray, 3x microfiber cloth - Perfect to clean the lens of your DSLR or GoPro camera - Also great for your smartphone, tablet, notebook, etc. This entry was posted in Discount Photography and tagged Also, Camera, Camkix, clean, Cleaning, Cloth, DSLR, etc., GoPro, great, lens, Microfiber, notebook, Perfect, Screen, Smartphone, spray, Tablet by Ball Photo. Bookmark the permalink.